Twelve students from the Southern Illinois University Edwardsville Upward Bound program were selected to participate in a 12-week program “Two Degrees” that explored career possibilities in the field of STEM (science, technology, engineering and math). “Two Degrees connected teens with STEM professionals, resources and prospects to help build their own networks and become prepared to pursue STEM jobs of the future,” said Javonda Quinn, director of the ESLC’s Upward Bound EC and BEM programs. The Upward Bound EC and BEM (East St. Louis, Cahokia, Brooklyn, East St. Louis and Madison high schools) programs at the SIUE East St. Louis Center partnered with the Youth Learning Center in St. Louis to provide a STEM educational advantage for teens from underrepresented communities through the Two Degrees program, which concluded on May 12. Students got the chance to interact with Bridge Coaches or STEM professionals to gain career advice and information. 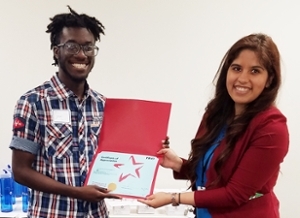 “I discovered a lot about the business aspect of STEM related jobs, how to network and build connections,” said Cornell Cox, Upward Bound EC alum who graduated from Cahokia High School on May 15. Cox won the Two Degree program’s speed networking first place award. The course culminated with the contest, which gave students two minutes to deliver an elevator pitch about what they wanted to study and why. “I talked about becoming an engineer. I chose engineering, because when I think of an engineer, I think of a problem solver,” Cox said. “An engineer also learns from the past to make the world a better place.” The award came with a $300 cash prize. Upward Bound (UB) helps youth prepare for higher education. Participants receive instruction in literature, composition, mathematics and science on college campuses after school, on Saturdays and during the summer. UB serves students from the following high schools: East St. Louis and Cahokia (EC) and Brooklyn, East St. Louis Charter and Madison (BEM). Cornell Cox, SIUE Upward Bound EC alum, won the Two Degree’s program first place award in speed networking. He received a certificate from Galicia Guerrero, Two Degrees program coordinator at the Youth Learning Center.